Obama sure has been busy for someone who’s in shutdown mode. Amongst the political turmoil, he is expected to announce his nomination of Janet Yellen as the next head of the US Federal Reserve any time now. This is kind of a big deal, as, if confirmed, she will be the first woman to lead the institution in its 100-year history. Yellen is an economist whose research pokes and prods the theories of monetary policy. She doesn’t just have her mind on the money, she’s worried about unemployment as well as inflation. So she’s good with numbers and she’s got a heart – win, win. ‘With employment so far from its maximum level and with inflation running below the committee’s 2% objective, I believe it’s appropriate for progress in the labour market to take centre stage in the conduct of monetary policy,’ she said in March. Yellen got her smarts at Yale and taught at Berkeley for over ten years. She also did a stint as head of Bill Clinton’s Council of Economic Advisers. 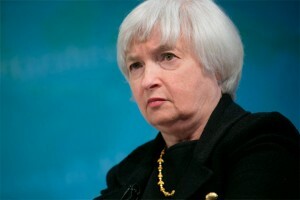 Since 2010, she’s been Ben Bernanke’s deputy as the Federal Reserves’ vice-chair. She obviously has the cred to take on the position, but she’s making the news because she’ll be doing a job that for the last century has been done by a bunch of old dudes. Rock on, Janet Yellen. This entry was posted in News and tagged in brief, women. Bookmark the permalink.